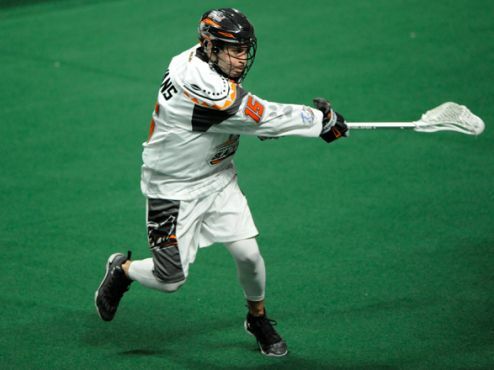 The skills used in box lacrosse makes for better lacrosse players on the field or in the box. Box Lacrosse is recognized as the most effective way to develop the skills of any lacrosse player. Not just playing lacrosse inside, but playing and learning box lacrosse skills and techniques is the focus of MN YBL. 9.STICK HANDLING | Playing in closer spaces means your stick skills have to be tighter and quicker. Your stick handling improves because there is no room for error, quite literally. 8.TRANSITION | Ball moves from defense to offense with increased speed. Players learn quickly to breakout and move the ball up the field. 7.DEFENSIVE BODY POSITION | No D-Poles means that defensive players have to use good body position to be successful. 6.OFF-BALL MOVEMENT | Playing in such a tight area means it is that much harder to get open. Running through people to go to goal just doesn't work. Players learn to cut, pick and keep in constant motion. 5.GOALIES SEE MORE RUBBER | Shots come hard and fast. Goalies see more shots in a shorter period of time. There hands and reaction time become much quicker. 4.SHOOTING ACCURACY | Gary Gait is among many who have gone on record about the shooting accuracy that comes from playing box lacrosse. 3.REACTION TIME | Almost every point made deals with faster speeds. A byproduct of playing faster is you have to react faster. That means faster to a ground ball, faster in transition, faster to play the ball, faster to shoot the ball. You name it, your reaction to it gets faster. 2.PLAYER SAFETY | When it comes to pre-season training, the goal is to get better for the Spring season, not get hurt. Many indoor facilities boast full fields, which ultimately are surrounded by some sort of netting. As one of the area's top orthopedic doctors pointed out, the box is a safer playing surface. There is nothing to get tripped up on and in to. 1.PROVEN SUCCESS | You can list as many of the benefits as you want, but the proof is in the success that box players have. Look at the most successful players over the last decade. The majority play box in the off season. Paul Rabil, Casey Powell, the Gait brothers. No matter who you identify with, the common thread is that they have or still do play box lacrosse. "I knew that if I wanted to be one of the best players in the world, I would have to dedicate myself to both the indoor and the outdoor game. Playing indoor lacrosse has been a great thing for my career." You are invited to join Shawn Evans and other for Southwest Florida's Box Only Lacrosse Camp. A limited number of kids per age group. 10. FASTER PLAY | The game speed is much faster than anything you would see outdoors. It makes playing outside seem like going in slow motion. 9. STICK HANDLING | Playing in closer spaces means your stick skills have to be tighter and quicker. Your stick handling improves because there is no room for error, quite literally. 8. TRANSITION | Ball moves from defense to offense with increased speed. Players learn quickly to breakout and move the ball up the field. 7. DEFENSIVE BODY POSITION | No D-Poles means that defensive players have to use good body position to be successful. 6. OFF-BALL MOVEMENT | Playing in such a tight area means it is that much harder to get open. Running through people to go to goal just doesn’t work. Players learn to cut, pick and keep in constant motion. 5. GOALIES SEE MORE SHOTS | Shots come hard and fast. Goalies see more shots in a shorter period of time. Their hands and reaction time become much quicker. 4. SHOOTING ACCURACY | Gary Gait is among many who have gone on record about the shooting accuracy that comes from playing box lacrosse. 3. REACTION TIME | A byproduct of playing faster is you have to react faster. That means faster to a ground ball, faster in transition, faster to play the ball, faster to shoot the ball. You name it, your reaction will get faster. 2. PLAYER SAFETY | When it comes to pre-season training, the goal is to get better for the Spring season, not get hurt. 1. PROVEN SUCCESS | You can list as many of the benefits as you want, but the proof is in the success that box players have. Look at the most successful players over the last decade. The majority play box in the offseason. Paul Rabil, Casey Powell, the Gait brothers. No matter who you identify with, the common thread is that they have or still do play box lacrosse.